Mmmmmm....pizza. That's pretty much what I thought when I saw the recipe for French Bread Pizza in Every Day with Rachael Ray. This was a comfort meal for us shortly after Darcy was born. It was also a meal with a short list of ingredients and a very short clean up time. All essential elements when you are completely wiped out. The main ingredients on this pizza are gruyere cheese and ham. Now, gruyere ain't cheap, but I think it is completely worth the extra cash if you are into cheese. If cheese isn't your thing, I'd go for the cheaper swiss cheese. 1. Preheat the oven to 400°. In a small saucepan, cook the butter and flour over medium-low heat, whisking, for 1 minute. Whisk in the milk, then season with salt and pepper. Remove from the heat and whisk in 1 tablespoon mustard. 2. 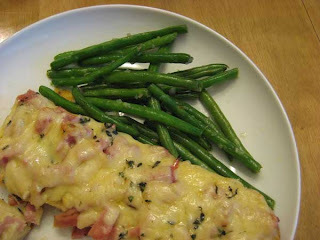 Slather a quarter of the white sauce over each baguette quarter, then top with the ham, gruyère and thyme. Bake until the cheese is bubbly, about 12 minutes. 3. Meanwhile, in a small bowl, combine the shallot and vinegar. Stir in the remaining 3 tablespoons mustard, then whisk in the EVOO. In a large bowl, combine the frisée, cucumber and radish; toss with the dressing. Serve the salad with the pizza. I don't remember this recipe. Funny thing about the magazines; I get so many, so, if I don't use them that month they go on the shelf and rarely get touched again. That's where blogs come in, other people notice something I overlooked. Her mushroom version(if you're a fan of mushrooms) in her Express Lane book is awesome!